Summer arrives, school lets out and one thing is a given. My teenager will live in his swim trunks all summer long. Our mission (for years now) has been to find a pair of trunks that (1) don’t “look” like swim trunks (aka look nice with a t-shirt) and (2) fit well (aka don’t hang, fall off when jumping in/out of the pool & dry quickly). I was beginning to think that there were no products in existance with these qualifiers, until Dry Dudz that is. Dry Dudz is the only suit I have found that is active wear, swimwear and trendy attire all-in-one. Every piece of Dry Dudz™ apparel sports a DD Quick Dry wikTec fabric liner. This highly breathable, quick-dry material wicks away moisture from the inside out, keeping the wearer’s skin dry all day. This is exactly what I was looking for when purchasing swimwear for my active son. My son has been in sports since he was five. We have tried on, purchased and thrown away many performance apparel items because they just don’t perform the way we need them to. Dry Dudz stands out as one of the lightest shorts on the market thanks to an innovative 115g polyester fabric weave. A four-way stretch polyester-nylon hybrid lets boardshorts move with the body, while an inner thigh lining and elastic in the waistline’s back optimize movement forward and laterally. 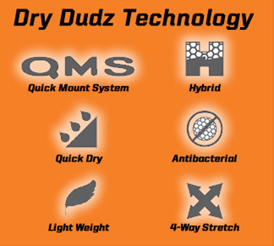 Every Dry Dudz product also has an anti-bacterial treatment that prevents odor and helps reduce wash time. Made for both men and women, Dry Dudz apparel is perfect for extreme sports or general outdoor activities. Dry Dudz men’s boardshorts come in five contemporary graphic designs, stylish enough to serve as upscale casual wear. Dry Dudz women’s trunks and bikinis forgivingly fit any body shape, and can be worn high for sports or rolled low for a great tan. Whether working up a sweat or exploring the globe, Dry Dudz ensures ongoing comfort that keeps its wearer going too. Dry Dudz make an outstanding gift for anyone on your list from trendsetters to globetrotters, outdoor adventurers to avid athletes, loved ones getting away for the winter to hard-to-shop-for dads and sons. Those look really cool! I’m going to see if there are more modest options for the tips for girls right now. These look really great though!! Perfect for camp for my son! The swimwear is awesome! Love the idea that they can hang out in them all day and not look like bathing trunks. I also love that they dry so quickly. Thanks for sharing. I like these! Perfect for a summer day you can wear them to play and to go swimming! These look great. We are heading on vacation over memorial day weekend, so we did some shopping for spring clothes this weekend at Berlington Coat Factory. We found some great new outfits. The y had some really nice discounts, and I loved the OSh Kosh B’gosh clothes they had in stock.